World Wide Waftage - Wafting Through Our World Wide Travels with Ease, Joy and Simplicity: Sugar Plantations in Kauai...Are there any left in Kauai? Sugar Plantations in Kauai...Are there any left in Kauai? Locomotive and coach formerly used for tours at the Kilauea Sugar Plantation, now closed for many years. 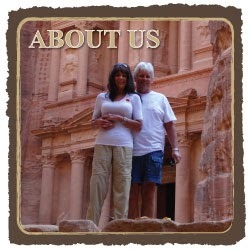 Several days ago, I'd mentioned posting information about sugar plantations in Kauai. Unfortunately, under the weather the past several days has left me feeling a little less creative for writing the equivalent of an essay on the topic of which I knew very little, having visited only one plantation in Maui. An abandoned sugar plantation from 1905. We'd hoped to visit a sugar plantation before we left the island of Kauai to have our own photos and story to share. However, after considerable research we discovered that all of them have closed, the most recent in 2007. As a result, I've borrowed the following information and photos from this site which tells the story better than I could have, especially after not being able to visit a sugar plantation while here in Kauai. I've changed the font for easier reading. "Sugar cane, or Ko in Hawaiian, is a perennial grass that can grow up to 20 feet high. Imported by the original Polynesian inhabitants of Hawai’i the plant was believed to have medicinal properties in addition to its sweet flavor. Once harvested the stalks are ground up and the liquid extracted by rollers to obtain juice, which is then slowly boiled down to create raw sugar. 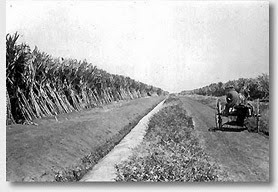 The first commercial sugarcane plantation was started at Koloa, Kauai in 1835. Early sugar planters faced a multitude of challenges including shortages of water, limited labor, and due to their isolated location a lack of markets for their sugar. It takes approximately 5 million gallons of water per acre to bring a crop of sugar ready to harvest during a two-year growing cycle. 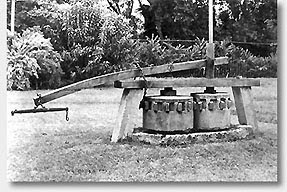 Just 20% of that amount comes from rain so the pioneer sugar planters solved water shortages by building irrigation systems that included aqueducts (the first built on Kauai in 1856), artesian wells (the first in 1879), and tunnels and mountain wells (the first in 1898). The 1876 Treaty of Reciprocity between the United States and the Kingdom of Hawaii eliminated the major trade barrier to Hawaii's closest major market for its raw sugar and a new industry in Hawaii was born. 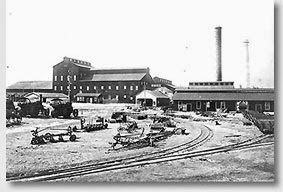 In just 60 short years raw sugar production reached 225,000 tons and by 1932 had grown to one million tons. 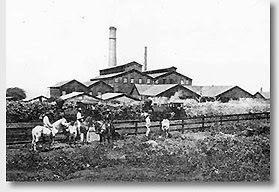 As the major commercial enterprise in rural Hawaii the plantations were cities unto themselves employing the majority of island labor force, providing housing, transportation, entertainment and later even electricity to the residents of Kauai through the power generated at their sugar mills. 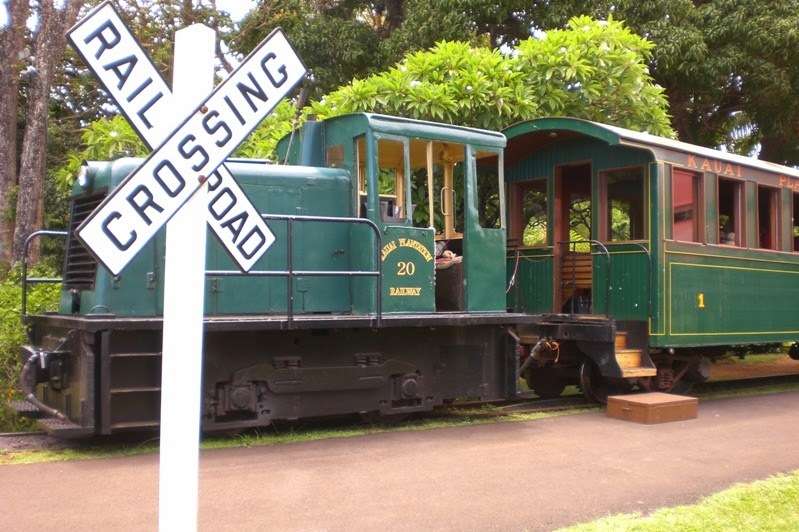 The first train came to Kauai in 1881 and served the Kilauea Plantation with 3 miles of track and five engines. 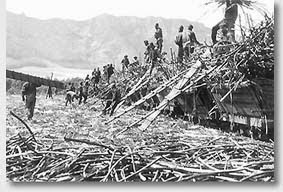 For over a century, sugarcane was the state's leading economic activity providing Hawaii's major source of employment and tax revenues. It takes approximately three feet of cane to produce one cube of sugar. On Kauai alone there were over 70,000 acres dedicated to sugar with up to nine major plantations operating across the island at any given time from the Hanalei River to the Mana Plain. Established 1899 Eleele, Kalaheo, and Lawai, Kauai"
As the prevalence of sugarcane in Hawaii deteriorated, tourism was promoted to take its place. "Sugar plantations suffered from many of the same afflictions that manufacturing market segments in the United States continue to feel. Labor costs increased significantly when Hawaii became a state and workers were no longer effectively indentured servants. The hierarchical caste system plantation managers had worked hard to maintain began to break down, with greater racial integrations as a result, ironically, of the sugar plantations. Workers began to discover they had rights, and in 1920 waged the first multi-cultural strike. Additionally global politics played a large role in the downfall of Hawaiian sugar. Shifting political alliances between 1902 and 1930 permitted Cuba to have a larger share of the United States sugar market, holding 45% of the domestic quota while Hawaii, the Philippines, and Puerto Rico shared 25%. The Big Five slowed the production of sugar as cheaper labor was found in India, South America and the Caribbean and concentrated their efforts on the imposition of a tourism-based society. Former plantation land was used by the conglomerates to build hotels and develop this tourist-based economy which has dominated the past fifty years of Hawaiian economics. [These statements are disputed and not verified or confirmed." 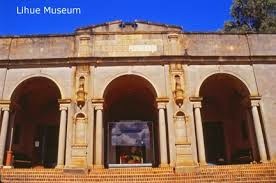 The Lihue Museum houses considerable information about the sugar plantations of decades past. Much to our surprise, Kauai doesn't have a feeling of tourists crowding every venue; its easy to book vacation homes and hotels (except over the holidays) and reservations are seldom required at restaurants. Other than difficulty we experienced in gaining access to the Kilauea Lighthouse, we've never waited in a long line at any tourist attractions. The only other difficult to access location has been the parking at the end of the highway heading northwest from Princeville to the Napali Coast and Ke'e Beach which we visited on several occasions. I'd love to return one more time to see if there's one more Hawaiian Monk Seal lying on the beach. Please click here to see the photos from the day Julie and I had "safari luck." A special heartfelt thank you to all of our family members who contacted me yesterday to wish me Happy Mother's Day and all of our friends and readers worldwide wishing me good health. I received more email than I could count making an effort to reply to each and every one. Today, I wouldn't post this blurry photo from one year ago today which was Mother's Day. My photo taking skills have improved a little since that time with much more learning on the horizon. For details from that day's post, please click here.